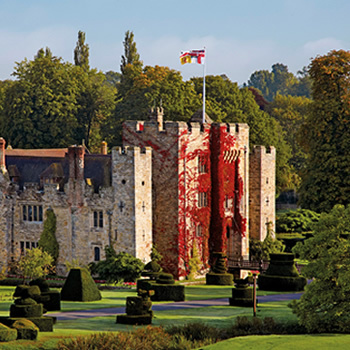 Set against the magnificent backdrop of Hever Castle, Hever Festival Theatre is a Summer celebration of all things British, from cream teas, a Time Machine and a trip to the seaside, to Elgar’s Pomp and Circumstance Marches. The richly varied programme begins in May and extends throughout the Summer months until the August bank holiday. The theatre is set in the Two Sisters’ Lawn Garden where you can enjoy a pre-show picnic under one of the beautiful trees edging the Two Sisters’ Pool or choose a different spot to admire the breath-taking views over the Hever lake before making your way to our magnificent covered theatre for a night of fabulous entertainment. The Festival began thirty four years ago as the Kent Repertory Theatre Company whilst the Festival has grown, its roots have not been forgotten. From plays to musical theatre, orchestral concerts to shows for families, we continue to offer a vibrant and exciting programme. Whether you are a lover of musicals, you believe a snail can save a whale or that Henry VIII was the first Brexiteer, there is an event to suit every taste. We are very proud to be celebrating our thirty fifth year at Hever Castle, we’ve come a long way since 1983 and we are excited about where we are going in the future. We very much look forward to sharing this year’s great line up of events and welcoming friends old and new to our magical open-air theatre this summer. The Festival Theatre is an open-air venue set in a magical location in the award winning gardens of Hever Castle in Edenbridge, Kent. The stage is fully covered and the seating is tiered with the vast majority of seats under canopies, which means if the sun doesn't shine, you can still enjoy the spectacular setting with protection from the weather.